Notes: This is the fourth series of Digimon, and it is not directly related to any of the other three. The Digital World is in danger of disappearing forever, and only a new crop of champions can save it from eternal oblivion. 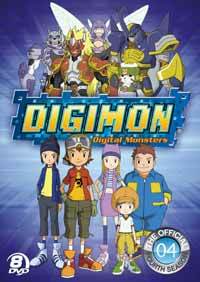 Takuya, Koji, Junpei (JP), Izumi (Zoe), and Tomoki (Tommy) are led to the Digital World and must integrate with their Digimon and become Digimon themselves to cleanse that world of corruption. Well, this isn't bad, but I'm afraid to say this is about the end of the line for my Digimon viewing career. After several decent seasons, Digimon's creative well of ideas is finally starting to run pretty dry, and this series resorts to having their main human characters actually turning into Digimon (using some extremely silly transformation footage) to get things done. Never mind that the series starts out with some eerie similarities with its contemporaries - just like Final Fantasy: Unlimited, this show starts out with a mysterious monster train, though unlike FF:U, the Digimon Frontier kids stay on the railroad for a wee bit longer than one episode. Basically, though, it's all an excuse to have some shenanigans with ill-behaved Digimon, cleanse the "evil" in a Fight-of-the-Day, and then move on. It's really standard stuff, and there's comparatively little drama here when placed alongside previous seasons. The characters are almost too standard, especially compared with previous seasons. The main character, especially, is just another Goggle Boy, and not terribly interesting. While merging them with their "Spirits" creates something interesting and amusing results, it's just not as compelling as before. And the technical aspects of this title aren't much more sophisticated than you'd expect from a kids show, with stock footage CG sequences and stills and pans galore. While the Japanese themes are (as usual) quite good (I'm always game for a Wada Kouji theme song), the American release leaves me completely bereft of enjoyment in that department - the Frontier theme is possibly worse than the original "Digimon are the CHAM-PIONS" song, instead settling for an incredibly cloying, crappy kid's ballad that would embarrass a camp counselor. In fact, after watching the original, the American release is just plain torture to sit through. While the characters are merely *okay* in Japanese, they're just not well-dubbed in English, and dubbing half the character's names just borders on the nonsensical. Yeah, I can understand and support the necessity of dubbing anime into the native language of its foreign audiences, but this isn't the kind of dub job that is going to convert anyone to that philosophy. The continuing lack of a home video release in any format simply adds insult to injury, though I do honestly have to question the salability of something so slipshod. Without a subtitled track, any Digimon Frontier release in the States would be practically worthless to me as a fan of the series, and frankly, I'm sure a lot of Digimon fans who have stuck through four years worth of this show would feel the same way. All in all, while the impossible-to-find Japanese release is worth watching for diehard Digi-fans due to the animation and somewhat likable characters, the North American broadcast release is substandard and to be avoided. Recommended Audience: Where there is some fantasy violence, it's really pretty tame stuff, and kids shouldn't have any problem viewing this one.